What is “thanksgiving”? Taking into consideration that everyone in America who is a believer, and everyone who recognizes God as Creator, today turns to God with hymns of praise, it follows that Thanksgiving Day has a religious character. For us Orthodox Christians, thanksgiving is our testimony to God’s presence in the life of the world and of human beings. Thanksgiving is the profoundly religious response of our hearts, testifying with reverent joy and trembling that the Lord participates in our personal lives through His majesty, glory, and love. Thanksgiving is our response to God’s gift. It is our joyful recognition of the mercy and goodness that God has shown to us in our lives. Finally, thanksgiving – a feeling of gratitude – is the foundation of our continuously renewed life in Jesus Christ, our Lord. The great Apostle Paul teaches us: Pray without ceasing. In every thing give thanks [1 Thessalonians 5:17-18]. This feeling of thanksgiving to God is the primary, basic feeling in which a child should be brought up from the earliest age, in order to become an emotionally healthy person who is inclined towards, and capable of, spiritual development. It is with these feelings and these wishes that we turn today to the Almighty with hymns of praise. Amen. 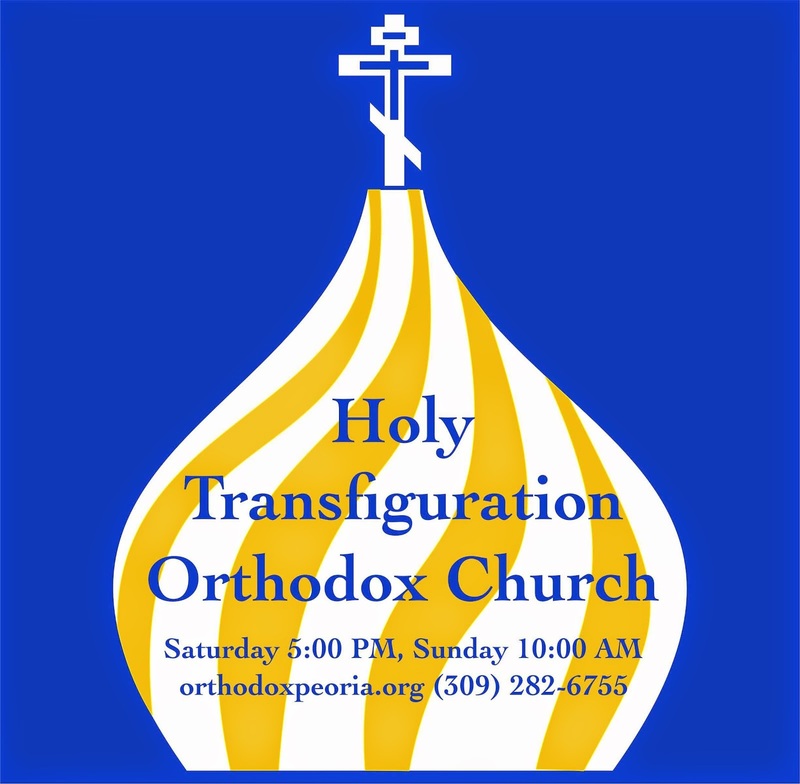 With the blessing of His Grace Bishop Peter, Holy Transfiguration Orthodox Mission will celebrate our first Divine Liturgy this Sunday, November 25, at 10AM. 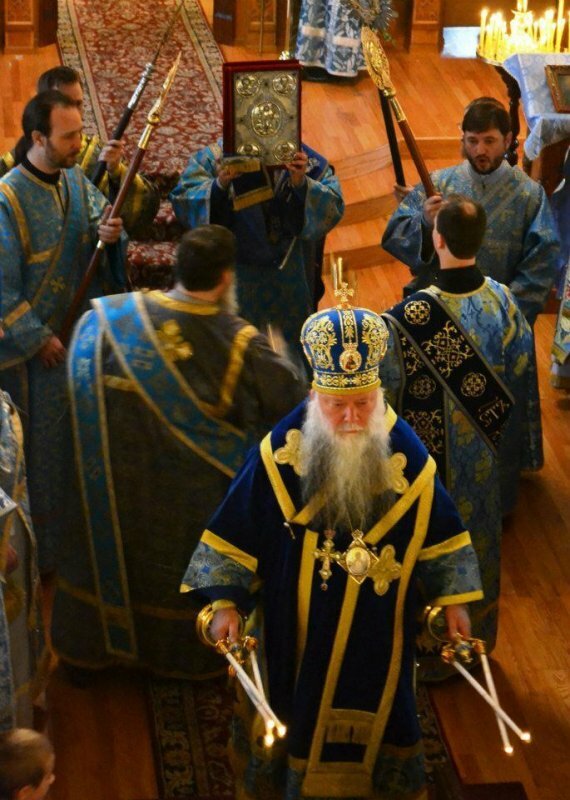 This will be the first-ever Divine Liturgy served in the Peoria, Illinois area by the Mid-America Diocese of the Russian Orthodox Church. The service will be held at at the historic Zion Church in Brimfield, Illinois. The service is to be celebrated by Peoria native, Archpriest David Moser. Fr. David was received into the Russian Orthodox Church in the 1970's while he was living in Indianapolis. He was ordained into the priesthood by reigning Archbishop Alypy of Chicago and Mid-America and currently serves as rector of St. Seraphim Orthodox Church in Boise, Idaho. 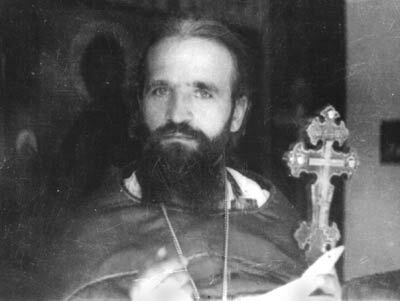 Services will be in English, starting with the Hours then the Divine Liturgy of St. John Chrysostom according to the Russian Typikon with Old (Julian) Calendar commemorations: 25th Sunday after Pentecost, Holy Hierarch John the Merciful, and St. Nilus the Faster. All are welcome and encouraged to attend this history-making event. 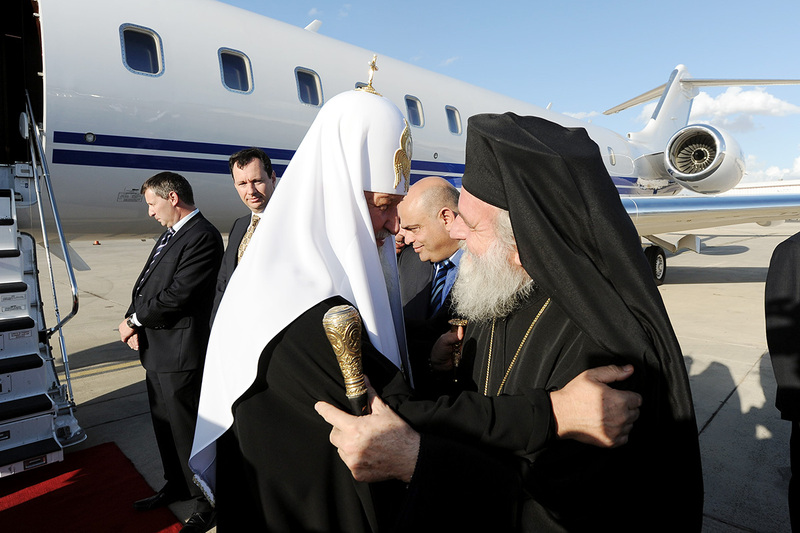 Russian Orthodox Patriarch Kirill arrived in Jerusalem on Friday on his first visit to the Holy Land since becoming head of the powerful church in 2009, an AFP correspondent said. As his motorcade arrived at the Old City’s Jaffa Gate, he was welcomed by a choir of Russian women and leaders of the Greek Orthodox church, as well as members of the Coptic and Armenian churches. Accompanied by heavy Russian and Israeli security, Kirill was led to the home of Jerusalem’s Greek Orthodox Patriarch Theophilos III, who welcomed him and proceeded to accompany him to the nearby Church of the Holy Sepulchre. The short distance to the church was scented with incense burnt by shop owners in honour of the event. Hundreds of Russian pilgrims eagerly awaited the arrival of their patriarch at the church. During his visit, Kirill will be meeting Israeli President Shimon Peres, Palestinian president Mahmud Abbas and King Abdullah II of Jordan in a new sign of his importance as a global religious figure. His trip “is the most important (religious) visit (to Israel) since that of the Pope Benedict XVI” in 2009, Israel’s foreign ministry said. Over the course of his six-day stay, Kirill, 65, is due to celebrate the liturgy with Theophilos and meet other local Christian leaders. He will travel to the Church of Nativity in Bethlehem, and visit Russian churches in Ein Karem and on the Mount of Olives. Kirill will meet with Israel’s chief rabbis, and visit the Yad Vashem Holocaust museum in Jerusalem. He will travel to Mount Tabor in northern Israel and visit Nazareth and Tiberius, as well as the nearby Church of the Twelve Apostles. He will then cross over to Jordan. 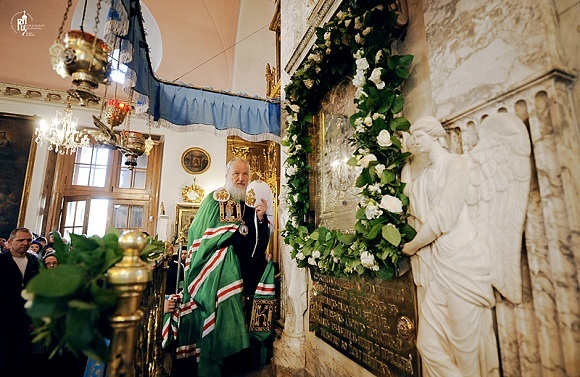 Spokesman of the Russian Orthodox Church, Father Alexander Volkov, told AFP the “visit has not and cannot have a political aspect.” But Kirill’s presence could help sort out a local problem in favour of the church, involving the Church of the Holy Sepulchre, located on the site where most Christians believe Jesus was crucified, buried and resurrected. A dispute with an Israeli water company over unpaid bills has prompted the Greek Orthodox church, which is a joint custodian, to threaten to close it. Evangelisation is the proclamation of the good news of salvation. It is not merely teaching a system of beliefs or transmitting a moral code. In this article Professor Archimandrite Job Getcha highlights the connection between evangelisation and our encounter with the living God in the Orthodox Liturgy. Evangelisation is the proclamation of the good news of salvation. It is not merely teaching a system of beliefs or transmitting a moral code. Therefore, evangelisation should always be linked with a personal experience, and an encounter with the living God, and not only with a pedagogical method. For the Orthodox Church, mission and evangelisation have always been linked with the liturgical experience. Worship has always been the starting point of mission and the heart of evangelisation. If we look in history, we can find several illustrations of this. One can recall the story of Cyril and Methodius. In the 9th century, when Rastislav, the chief of the people of Moravia, became irritated by the attitude of the Franc missionaries who were using Latin in the evangelisation process of his people, he asked the Byzantine emperor Michael III to send him missionaries who would know the Slavic language. Then the two learned brothers of Thessalonica, Cyril and Methodius, were sent to Moravia, and started their missionary work by translating the liturgical lectionary into the Slavic language as well as the liturgical books. It is said that Cyril translated the text of the four gospels to be read at worship, as well as the texts of the various liturgical services: matins, hours, vespers, compline and the Divine Liturgy. This is an important detail: the two famous missionaries did not start their evangelisation mission by translating a catechism, neither a handbook of doctrine, nor a compilation of sermons, but by bringing the liturgical texts to the language of the local people so that their mission could be done by the means of the liturgy. Another great example is the conversion of Kievan Rus’ around 988. In the famous Russian Primary Chronicle, it is said that the decisive point in the Christianisation of the Russian people was the experience of Prince Vladimir’s legates attending worship at Saint Sophia Cathedral in Constantinople: “We knew not whether we were in heaven or on earth, for surely there is no such splendour or beauty anywhere on earth. We cannot describe it to you: only this we know, that God dwells there among humans, and that their service surpasses the worship of all other places. For we cannot forget that beauty”. Indeed, this beauty, which is transmitted through the liturgical worship, is perceived in the Orthodox Church as an epiphany of Heaven on earth, as a way of uniting to the heavenly beauty, a bridge between the Kingdom of God and this world, a connecting point between time and eternity. Through worship, the Christian message does not remain merely a dead letter but becomes a living spirit, which vivifies and deifies. This story shows us that one cannot reduce Christianity to a series of moral rules, neither to a philosophical or doctrinal system. Christianity is a way of life, where doctrine is inseparable from the glorification of God. According to Georges Florovsky, “Christianity is a liturgical religion. The Church is first of all a worshipping community. Worship comes first, doctrine and discipline second”. Through worship, the true glorification becomes the expression of the true doctrine: “lex orandi” becomes “lex credendi”, since worship is the bearer and transmitter of faith. This is an important fact that one should have always in mind when addressing the question of Christian evangelisation and mission in today’s world. What Must We Do For Our Prayers to be Heard? Subdeacon Benjamin: In the context of this sermon, which is translated from Russian, the word "heard" must be read loosely. The Patriarch is addressing those who pray sincerely and yet don't receive, and yes still trust in God and His wisdom but do not stop there. They want to grow through the experience, learn, and become better. This is where the Patriarch's sermon applies. How is it that I become someone who prays more according to God's will, and also even more like those who the Scriptures tell us moved God to either action or to stay His hand. This is what the Patriarch means by being "heard". This is the means by which we better follow God and thus improve the quality of our prayers to Him. It's important to look at this principle NOT legalistically, but qualitatively. If I show contempt for that which my Father loves, then what kind of a son am I? Should I expect that my Father will "hear" me cheerfully and enthusiastically? No. He will "hear" that I need to be disciplined. I should instead repent and sensitively care for what He loves, other people, especially the poor. Then when I pray He will certainly "hear" me more eagerly because I love what He loves. His Holiness, Patriarch Kirill of Moscow and All Russia, delivered the following sermon on November 6, 2011, in the Church of the Joy of All Who Sorrow on Bolshaya Ordynka Street in Moscow. In his sermon, His Holiness combines a consideration of the Sunday Gospel reading (Luke 16:19-31) with reflections on the feast day of the Icon of the Joy of All Who Sorrow, which that year fell on Sunday. This year the icon is commemorated on this coming Tuesday. Your Eminences and Graces! Dear Vladyka Hilarion! I would like to thank you cordially for your kind words, for the wonderful gift of the icon of St. Alexis, Metropolitan of Moscow, and for the vestments that were sewn to match those depicted on this icon. Indeed, the Church is called upon to preserve tradition for one simple reason: because it is in the Church that man overcomes time. We have various means of dipping into the past: we can, for instance, read books or watch historical films – but this only makes us spectators of the past. In the Church, however, man becomes not just a spectator but, by the power of the Holy Spirit, a participant in all that the Lord has done for our salvation and even in that which is to come: in His birth, life, preaching, suffering, death, Resurrection, Ascension to the right hand of the Father, and His glorious Second Coming. It is in the Church, by the power of the Holy Spirit, that we, who are limited and weak, can partake of eternity through the Holy Mysteries; we can partake of that which was, which is, and which will be. It is in the Church, by the power of the Holy Spirit, that the Kingdom of God is revealed to us. It is no accident that at the beginning of the Church’s primary Mystery, that of the Holy Eucharist, we loudly proclaim these great words: “Blessed is the Kingdom of the Father, and of the Son, and of the Holy Spirit!” This is because it is by the power of the Holy Spirit, through the prayers of the Church’s faithful, and in the community of the faith that the Kingdom of God is revealed to us. But the Lord grants us the great opportunity of constantly coming into contact with His eternal and heavenly Kingdom: this means of coming into contact with God is prayer. Prayer possesses great power, but there is one necessary condition for our prayer truly to unite us with the Lord; there is one condition that must be met for God to answer our prayers. In today’s reading from the Gospel according to Luke we are offered the Savior’s parable of the rich man and Lazarus (Luke 16:19-31). This is one of the few places in Holy Scripture that offers us a glimpse of the mystery of the afterlife. Most likely no human words, knowledge, or categories of thought can give visible expression to the world that exists after man’s physical death. The Lord therefore speaks about this world in a language understandable to his hearers. He tells the parable of the rich man who lived sumptuously and the unfortunate and hungry Lazarus, who lay at the rich man’s gate covered in sores. Following his death, the unfortunate Lazarus – who had been covered in sores, who had been humiliated and powerless – found himself in the bosom of Abraham, in the Heavenly Kingdom; but the rich and successful man found himself in hades. Reflecting on the meaning of this parable, St. Cyprian of Carthage spoke words that St. Basil the Great later repeated. These words help us to understand the necessary condition for God to hear our prayers: “If we do not hear the entreaties of the poor, then we are undeserving to have our prayers heard by God.” What wonderful and astonishing words! They resonate with the foundational “golden” rule of life laid down in the Gospel: Therefore all things whatsoever ye would that men should do to you, do ye even so to them (Matthew 7:12). These words can also be paraphrased so as to say: “How you want the Lord to treat you is how you should treat your neighbors,” because the Lord appears to us in the image of our neighbor. If we are indifferent to the sorrows of others, if our hearts are deaf and unresponsive to human sorrow and need, then we will pray and weep in vain – these will be crocodile tears, tears for ourselves, tears that are not pleasing to God. Our prayer must be accompanied by help and love for our neighbors. Then we will be with Lazarus in the bosom of Abraham, then the Lord will hear our sighs. As St. Cyril put it so beautifully, the entire mystery of our spiritual lives depends on this. There can be no prayer without good deeds; there can be no hope of salvation without good deeds, for faith without works is dead (cf. James 2:17). When we enter this church with all our sorrows, when we bow down before the Icon of the Joy of All Who Sorrow and ask the Queen of Heaven to help us in our sorrow, let us then recall: Have we always helped the sorrowful? Have we not coldly and heartlessly passed by those asking for help? Have we perhaps justified ourselves by saying: I will not help them, they are such-and-such; there is no need to waste strength of soul and time on them… Then why should the Mother of God help us? Only because we are weeping before the icon from the pain that life circumstances have inflicted upon our hearts? Is this enough? St. Cyprian teaches us: no, it is not enough. 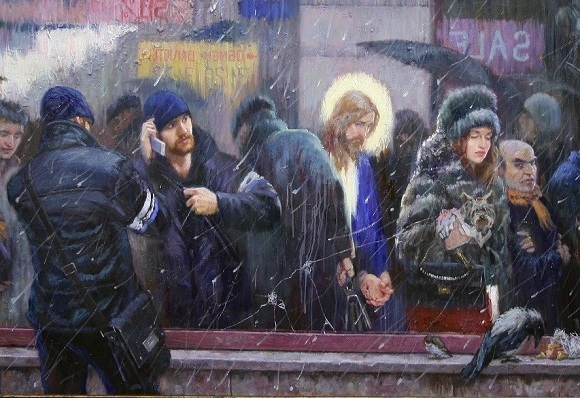 This is why an Orthodox parish or community that celebrates the Holy Eucharist, which comes into contact with the Kingdom of God by the power of the Holy Spirit, should be a place of mercy, charity, and real love – perhaps first of all to needy parishioners, to those standing right next to us: those who might not eat today after the Divine Liturgy; those who might shiver from the cold because their clothing is poor; those who live in unknown circumstances. After all, it often happens that people who come to church are alone and do not have what others have, for which reason they are seeking our help here. The Lord can send such help only through us, through our hands. Then, having graciously responded to the pain and suffering of another person, we will be heard by God and His Most Pure Mother, receiving that for which we have prayed. All of this is taught to us by today’s feast day of the Icon of the Joy of All Who Sorrow; the wonderful Gospel reading teaches us this as well, unlocking the mystery of the afterlife; and that great saint, Cyprian of Carthage, who upheld Orthodoxy during the difficult persecution of faith in the third century, also teaches us this. Let us listen to these words and to this call, recognizing the connection between salvation and good deeds! As we embark on the path of performing good deeds, may the Lord grant us the joy of feeling His real presence in our lives! And may this feeling strengthen in us the faith and determination to do good for the glory of His holy name! Amen.